A new Dota 2 tournament series has been announced by Valve: the Major. This new championship will have four editions across the entire year – Fall, Winter, Spring, Summer (TI) – and they are ought to become the most important tournaments after The International. The first tournament in this series will be held in Frankfurt (Germany). The 2015 Frankfurt Major will have a duration of 6 days starting from November 16. Top teams like EG, Secret, CDEC and LGD will fight for a slice of the 3 million dollar prize. The rest of the tournament will be open to the public. The Fall Majors are now finished. There were some surprises specially in the Group D bracket in which open qualifiers Mineski was able to slip through the upper brackets defeating EHOME and Alliance. CDEC gaming topped Group D winning all of its games. There were no surprises in Group A as it was topped by Evil Geniuses defeating Fnatic and Virtus.Pro. Group B was won by Vici Gaming followed closely by surprise invite Vega Sqaudron. Team Secret grabs first place in Group C followed closely by LGD Gaming. The top 2 finishers in each group will automatically placed in the upper brackets. If we were to predict which teams would get an invite two weeks ago, probably we wouldn’t have thought of Vega. However, they deserved one after their incredible performance at the ESL One NY 2015, where they started beating the TI5 champions 2-0 and ended up winning 2-1 against Secret in the finals. This demonstration earned them a place at one of the biggest tournaments in the history of Dota. 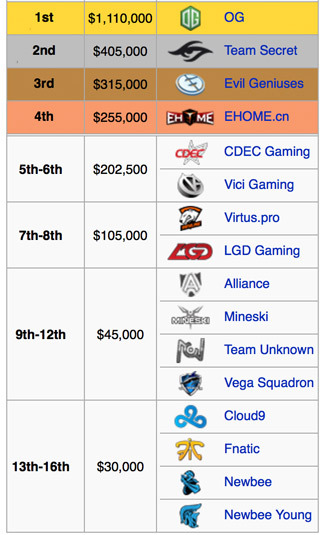 On the other hand, teams like EG and CDEC have a lot to show now. They did not do very well at ESL. This is especially true for EG, as they couldn’t win a single game in that tournament. We will see if the Frankfurt Major will bring out the best out of them. We must remember these teams hadn’t had a single game after TI5. Many bookmakers have odds and bets for The Frankfurt Mayor Dota 2 tournament in 2015. Read more about the various Dota 2 betting sites to compare the best odds for your favourite teams or take a look at the current betting odds below. User from the US should take a look at the daily fantasy service of Vulcun where you can play for real money. The odds shown here might have changed in the meantime. You can follow the links to the betting sites to check if they changed by now.